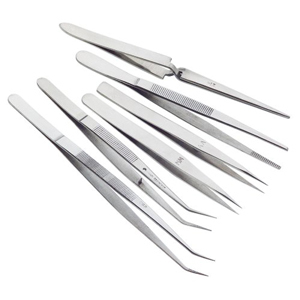 This 6 piece set of stainless steel tweezers includes every shape and size needed for the workshop. 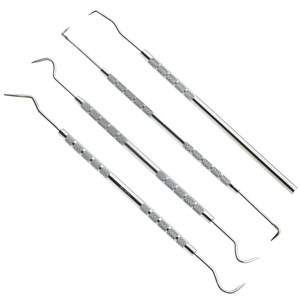 They range in length from 5" to 6-3/4"
This stainless steel Dental Pick Set is perfect for a variety of uses around the shop - cleaning out cuts or detailing carvings. Works great for removing paint from cracks and crevices when stripping. Each pick features two different pick styles, a knurled handle and measures 6-1/2 inch long. Set includes protective pouch.